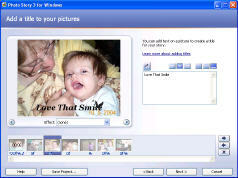 Microsoft Photo Story 3 is free slide show software that is quite amazing, easy and fun to use. I have purchased slide show software that was far from free ($70) that didn’t do much more than Microsoft Photo Story 3. The bad news -- it has pretty much let go by Microsoft, meaning that it has not been updated recently. Originally designed to work with Windows XP, it also works with Vista and Windows 7. If you are still reading this, I assume that you have Windows XP (Vista or 7). Despite its limitations, it is a nice piece of software, especially for someone looking for a simple way to put pictures and music together. Microsoft Photo Story 3 lets the user create professional-looking slide shows. Background music can be added to really give your show a professional appearance. Additionally each picture can be individually narrarated, making this truly a great way to tell your story (or any other) with picture and voice! Getting your pictures gathered from your computer and into your photo story slide show is simple. For each story, you can import up to 300 photos. 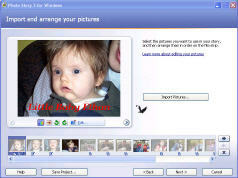 Photo formats supported are numerous and include .bmp, .dib, .eps, .gif, .jhif, .jpe, .jpef,, .pcd, .pcx, .png, . psd, .rle, .tga and .tif. With the simple click of a button you'll be able to add all the pictures that you wish to your show. Once added, they will appear in filmstrip format near the bottom of the screen. As you add more photos, Microsoft Photo Story 3 will add them to the end of the film strip. What a great feature this is! If you've ever used a scanner to scan some of your pictures onto your computer, you'll love this. Often times, a scanned photo will have a black border around it. Photo Story 3 makes getting rid of this a cinch. You'll have the option of using the "Remove black borders button" if needed. This option is available if your pictures do not conform to the 4:3 aspect ratio (this is the relation of the width to the height of your photo). Photo Story 3 will attempt to remove these black borders automatically based on what it thinks is the best fit for each photo, but all this can be manually altered by you. It works amazingly well. I was very impressed with the "Correct Color Levels" and the "Correct Contrast" function. Corrections made on several of my photos were impressive and immediately apparent within the preview function. There were some instances, though, where I saw relatively little change. Perhaps there was less to correct in some of my photos. Titles and wording can be added to any of your photos as you wish. Just type what you want and a simple click or two will place and change the font type, size and or color, as you see fit. You can record up to five minutes of narration to each of your photos. Photos can be narrated in any order desired. If you don't like what you recorded, simply delete it and start again. Also provided is a place to types notes for each of your pictures. This is designed to help you remember what you wanted to say about each picture. Great for someone as forgetful as me! This function alone breathes so much life into your photo story show. 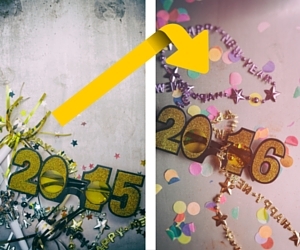 Until recently most slide show software would simply cycle through your photos. Fade in...fade out. That use to be impressive, but now you can add motion to your photos. Microsoft Photo Story 3 automatically will add these effects to your slide show, but if you want to personalize and make your show even better, you can do so manually. I recommend that you do this. 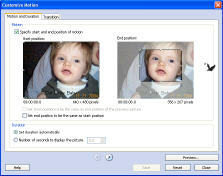 By setting the motion manually, you can select the general areas of a picture that will appear at the beginning and the end of a picture's video clip. You can add background music that will play during your story. Music formats supported are WMA, MP# and WAV. A different song can be used for each photo or for a group of photos. The latter option is recommended, because each song added will add to the file size and playing time of your story. NOTE: Microsoft Photo Story 3 will not allow you to use a Digital Rights Management protected track (DRM). It will not work! These are songs that you downloaded from sites such as MSN Music Store. You'll really love this part! My kids and I played with this part of the program for quite awhile. The Create Music option allows you to customize pre-recorded songs by selecting the genre, style, bands, mood, temp and intensity of the music. These songs are royalty free. Depending on how you will use your story, Photo Story 3 will let you choose an "activity" and save the story. 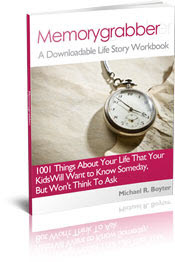 The activity that you select will determine the quality settings used to save your story. 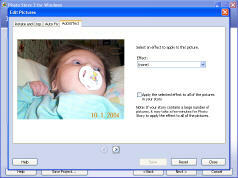 Default settings include saving to your computer, sending the story in an e-mail message and saving to portable devices such as Pocket PC's and Smartphones. I was amazed at how Microsoft Photo Story 3 was able to compress 17MB of pictures, music and effects into a manageable file size, of about 1.7MB to 4.2MB in size. This is the range between the lowest "activity" setting and the highest. I was extremely impressed with this software. This is an outstanding piece of software that no Windows XP user should be without. Microsoft Photo Story 3 is the perfect way to put your photos (the countless ones that are just sitting on your hard drive) to good use. Make a great-looking slide show and send it to family. This software has far reaching uses. I can imagine that such professionals as real estate agents could really put this software to work for them in show-caseing properties. NOTE: While Windows XP, Vista or Windows 7 is required to use this software, the family or friend that you may send your story to DOES NOT need those same operating systems. Download Photo Story 3. It is completely free.